Gör det lättre att montera dina golfklubbor! The Industrial Golf Club Curing rack on wheels is the idea solution for carting clubs out of the way after assembly to let the epoxy bond cure without disturbance. 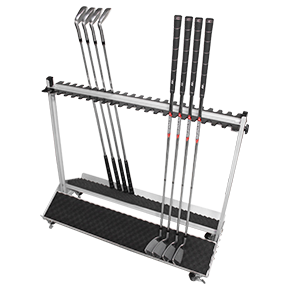 The rack accommodates up to 44 /22 clubs of any type as the rack can be adjusted for lie and length in seconds! The Base of the display is covered with an alveolar foam that moulds around the heads to prevent slippage when moving the cart. The cart ships flat with all the accessories needed for self assembly."